The Lock-a-Draw draw keep is for compound bows. It mounts on your bow sight, not on your bow. It will fit any bow that has a bow sight with two threaded or nut backed holes for mounting a bow mounted quiver. 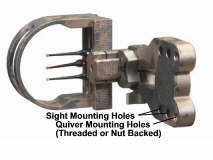 If your bow sight does not have the holes for mounting a bow mounted quiver you will have to change your sight to one that supports a quiver to use the Lock-a-Draw draw keep. If you already have a bow mounted quiver on your bow, you will have to remove the mounting block and install the quiver mounting block that comes with the Lock-a-Draw quiver. If you have questions concerning this, please call me. I stand behind my pledge to give refunds, but some people are returning their Lock-a-Draws saying it doesn't fit their bow when it obviously does. This results in extra costs for both the customer and myself. Please be advised that the Lock-a-Draw draw keep requires simple assembly and tuning. Tuning instructions are enclosed with the product, but it is also available here: Tuning Instructions.pdf. It comes with 31" rod that has to be cut off for your draw length, and the trigger release is glued on with epoxy cement. Tuning involves bending the rod so that the string catch matches your anchor point when drawing the bow. This is done by paper tuning. The Compound Bow Rest & Holder also requires simple assembly. Complete instructions are enclosed with each unit. 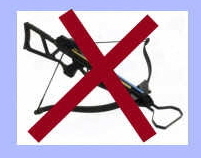 Please note that the Lock-a-Draw draw keep is not appropriate for bows that require more than 25 lbs to maintain a draw. For example, a 70 lb bow with a 65% letoff would be 70(1-0.65)= 24.5 lbs. 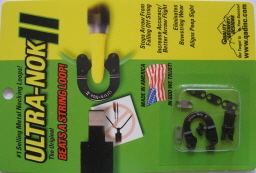 The ULTRAN-NOK II is recommended because it provides a specific spot to hook the string catch of your Lock-a-Draw release, makes it easier to tune, helps to align your peep, and prevents bowstring wear.. The ULTRAN-NOK II is offered as an add on because some may already have a nocking loop. A string loop works just fine also. Ultra-Nock II - Not absolutely necessary, but strongly recommended. It provides a convenient nocking point and prevents string wear. Foot Stirrup - Allows the bow to be drawn from a standing position. It replaces the stabilizer and is useful in target practice. Any of the products may be returned in the original, saleable condition for a refund of the purchase price within 30 days of purchase date. If the Lock-a-Draw rod has been cut, $15.00 will be deducted from the refund price because the rod will no longer be salable. Shipping will not be refunded. All products are warranted to be free from defects in material and workmanship for a period of one year. The defective product must be returned at your expense. It will be replaced or repaired and returned to you free of charge. Please call before returning any product.